By contemporary standards, Rapid City airport is small. It is, however, a gateway to a veritable cornucopia of treats for the senses of the more peripatetic masses, as well as the mind. The Black Hills of South Dakota was the 19th Century setting for countless legends, and stories, both historic, and fabricated. One of the fun parts of this caper was to try to separate the historic from the hyperbole of the day. Upon checking into our hotel, we decided on a day of rest. Super-early flights can be a bit much. So, we took to the pool and Jacuzzi, a wise choice, considering the schedule that we laid out ahead for ourselves. There is so much to see, and do, it boggles the mind. The only hitch is that one must drive to, and/or through each bit of wonderment, which, at times was like an old “E” ticket ride at Disneyland. Upon leaving the city limits of Rapid City, it was as if a klaxon was sounded, and there, stretched out before us were gracefully rolling hills with some herds of buffalo, steers, and horses. We immediately got to see what the Indians had treasured, and what the White man purloined. 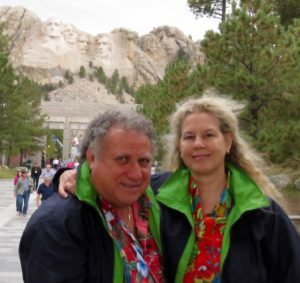 Our primary objective, of course, was Mount Rushmore. However, in our zeal to get to this incredible carving, we missed the turn-off, and wound up in Nebraska. At that point, we both realized that land navigation was not a strong suit for either of us. Did this slight mishap dampen our ardor for the mount? Yes. We went to the Mammoth Site of Hot Springs, which was easier to find from where we were, to lick our wounds, and also to say to ourselves, “Yeah. We meant to do this first, so that we could save the best for later.” There were to be no bruised egos on this venture. Another factor in our choice was the fact that it had started raining, and the Mammoth Site is an indoor attraction. It’s rather like the La Brea Tar Pits on steroids. Apparently a few hundred thousand years ago, a huge sinkhole filled with water, akin to the cenote that we saw and swam in in Mexico, lured the giant beasts to its water. Sadly, mammoths were not known for their grace and agility. Thus, when they bent over to drink, many of them slipped into the sinkhole, and couldn’t climb back out. Ergo, they either drowned, or starved to death as they were set upon by birds of prey, and a few big-toothed mammals looking for a quick and easy meal. The collection of bones is fantastic, both in their number, and their state of preservation. Our guide was very knowledgeable, and fielded questions that weren’t on his list of things to share with us. All in all, it was a great way to play “Pat the Paleontologist” for a day. How’s that for eliminating gender? There were also displays of the habitats and weapons of the early dwellers of our land. They adapted to everything but European invaders. At this point, there was nothing to do but hit the souvenir shop, and purchase invaluable treasures that we, until that moment, didn’t know that we so terribly needed for ourselves, and our house. It was, by now, starting to get dark. We figured it would be a good time to find our way back to our hotel, have some cocktails and dinner, as we relived our day’s adventure, and hit the sack for some rest. Tomorrow, we decided, was sure to be a day of more driving, and more venues for us to explore. After yesterday’s crazies, we decided to check out the Reptile Gardens. It was located only six miles from our hotel. They have a young man who did a snake presentation, behind a short glass enclosure. As he was putting the serpents through their paces, we realized that they, the snakes, were not de-fanged, nor were their lips sewn shut like the cobras we encountered in Marrakesh. This was real deal handling of venomous creatures of various species, but all with the ability to kill. Yes. We kept our attention focused in case one of the slimy creatures got out of the little display area. From there, we went to the alligator/crocodile pool, where the same gentleman showed us how to properly wrestle, and feed these reprobates from prehistoric times. Yes. Once again, we focused on the acts being presented by this Paul Hogan incarnate. Thank goodness he kept them at either arm’s length, or stick’s length. It was then that I realized that I didn’t want his job. 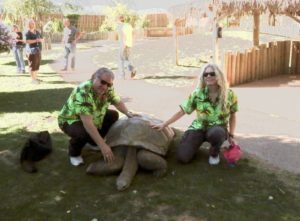 As we walked around the other, more tame exhibits, we came upon the giant tortoise’s area. These creatures are huge. We were permitted to touch their shells as well as their necks. At one point, we got separated for a few moments. Suddenly I heard my wife, Naomi, calling me. It seemed that she had come across a pair of giant tortoises in need of a hotel room, or at least a back seat of a sedan. Yes. They were mating in a most vocal manner. When the male finally dismounted his paramour, I thought he would offer her a cigarette or martini. No. One of his buddies, then unceremoniously took his place, thus making it a classic ménage á trois. When tortoise number two dismounted, he also proffered nothing. As a matter of fact, he took off with tortoise number one, apparently to hang out, and/or swap snappy stories. It didn’t seem to bother the female recipient of the males’ attention. She just went on her own way, perhaps to share her latest story with one of the other tortoises of her gender. I guess social graces are not necessarily a part of reptile kingdom. Now it was time to check out the souvenir shop, where we found stuff that, again, until that moment, we hadn’t realized that we so desperately needed for our house. Thank goodness they ship. There was no way to pack this assortment of treasures. Having spent over four hours at the Reptile Gardens, we decided to call it a day, and head back to our hotel. Yes. More pool. More Jacuzzi. More cocktails. More dinner. Well hey. It’s tough being on vacation. One must recoup from a hard day at play. Today we took off to Deadwood. It’s a lot like Knott’s Berry Farm used to be, but on steroids. The main street is lined with saloons, kitsch shops, and restaurants. We were fortunate to find a small parking lot behind a saloon that shares a common wall with Saloon #10, where Wild Bill (James Butler) Hickok got his brains blown out by Jack McCall, August 2, 1876, while he, Hickok, was playing five-card draw poker. The hand Hickok was holding, black aces and black eights with either a red jack, or red queen, is still referred to as the “Dead Man’s Hand.” Sadly, it was the one time that Hickok didn’t have a seat that put him with his back to the wall. The bullet went through Hickok’s brain, out his right cheek, and into the left wrist of riverboat captain William R. Massie. As a little side note, Massie never had the bullet removed from his wrist. Hickok was buried, and eulogized by his friend, Charlie Utter. The original grave, and gravestone was so ravaged by souvenir seekers, that when the Mount Moriah Cemetery was put together, Hickok’s body was exhumed and re-interred there under the supervision of Hickok’s widow, Agnes, with a statue and fence around it. Calamity Jane is buried next to him, also with a fence around her grave. The hike up to their grave sites from the parking lot at Mount Moriah is rather steep. 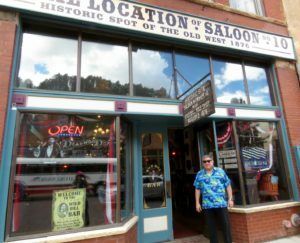 Meanwhile back at the saloon, there was no shortage of locals who were more than happy to share stories of their town, and some of the more colorful characters of its past. Now it was time to see the Adams Museum, about which we’d heard so much. It more than lived up to its reputation. “You want it. They’ve got it.” The Adams houses memorabilia of every sort, from every aspect of the heyday era of Deadwood. Included in one of the many display cases is one of the last letters written by Wild Bill Hickok to his wife, Agnes. There is even the remains of the original statue that was at his original grave that had been vandalized by souvenir seekers. In another case, is a yarmulke, menorah, tallis (prayer shawl), and other accoutrements for worship in a Jewish temple. Strangely, there was a rather large Jewish population in Deadwood, but no synagogue. The vehicles of the time are also on display, along with weapons, and clothing. The artifacts are wonderfully displayed, along with documents explaining many of them. All in all, it’s a wonderful place to take a trip back to that era in one’s mind, while in the place where it all actually happened. This place is definitely a “must see” for even the slightest culture vulture. Allow at least two hours to fully enjoy it. We arrived at the mount just as dusk was beginning, along with some ominous appearing clouds. We had a bit of time before the light-show was to begin. Yes. They light-up Mount Rushmore for a truly spectacular display…Not that the faces weren’t impressive enough, but a little “showbiz” never hurt anyone. It started to sprinkle a bit, so we took refuge under one of the eaves of the book store that faced the faces. Thank goodness we did. Suddenly it was a deluge, worthy of a tropical isle. Nonetheless, the show went on, complete with patriotic music, and an announcer, who did an abbreviated presentation due to the rain. Following the presentation, we made our way back to our car to begin our ride back to our hotel. For some reason, we took “the long way back.” Upon arriving, we did, indeed, have the nectar of the cocktail plant, and then a long-awaited dinner, and some sack time. Up, bright and early to see the biggest carving we’ve ever witnessed. Seeing the Crazy Horse memorial, a work in progress that they target 2050 for completion, is an experience in itself. It’s approximately ten times the size of the Mount Rushmore sculpture. Sculptor Korczak Ziolkowski (1908-1982) was asked by Chief Henry Standing Bear, of the Lakota Tribe, to come to the Black Hills and carve a mountain tribute to Chief Crazy Horse. The Boston-born sculptor, of Polish descent, couldn’t pass up such an invitation, or artistic challenge. The work began in 1948, when, incidentally Korczak had $174.00 in his pocket. His soon-to-be wife, Ruth (1926-2014) followed him from West Hartford, Connecticut. They were married Thanksgiving Day, 1950, and had ten children. I guess Korczak took some breaks from chipping and chiseling. The memorial became a family project. Supported by donations from various charities and societies, along with monies from visitors like Naomi and me who want to see this Herculean project progress. The vastness of the size is truly Homeric. It must simply be seen to be believed. We saw it. We believe it. Following this jaunt, it was time to prepare for our flight home. After doing the TSA rhumba, we headed for our gate, which was located near the restaurant. It was time for lunch, and we had time before our flight to relax and have a casual meal, so we did. Yes. Buffalo Burgers for the two of us. They were fabulous, not dry like lean buffalo meat is so often served. We also met up with some people from the San Fernando Valley, with whom we chatted while having our and their lunch. Finally it was time for our flight. 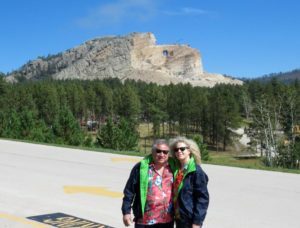 We bid farewell to our fellow “Valleyites,” along with taking a last look at the Rapid City Airport, which truly is a gateway to a whole world of things to do and see.